The center of our store is easily converted more than once a week into an expansive class space, allowing for many events to be held on a regular basis! Jane and Charlie lead the majority of the classes, as well as host collaborators who share in a spiritual practice! Sitting in a circle with like-minded individuals can be very healing in hectic 2019! Taking time to connect with that peaceful powerful place within is so important! variety of different ways to help you disconnect from the busyness of your day – whether it be a discussion of different stones to help alleviate stress, time spent with singing bowls or drums... The time is spent in helping you revitalize and re-energize, body, mind and spirit. These classes are led by Jane, the owner of Wisdom of the Ages! Each class is $10 per person, which includes a free pocket rock! We record every guided meditation, so if you'd like a copy of one of the meditations you did with us in class on a CD or a downloadable audio file, they're just $5! If you call us, email us or stop in to reserve a space, we'll have a seat set out for you! But walk-ins are welcome, so no need to stress about a reservation! :) We hope to see you there! Make Your Own Wire Wrapped Gemstone Pendant! ​$20, including the wire for your pendant! Contact us to reserve your space! Choose your favorite stone to bring with you to the class or purchase one in the store - anything a little flatter will work best! Bryan will provide the wire and teach you step-by-step how to turn your gorgeous healing gemstone into a beautiful handmade pendant! You can even walk out wearing it! You must contact us (by email, phone or stopping in) or you can click “Going” on this event on Facebook (click on the name of the class above to visit the page) to reserve your space! Space is limited for this class! - And please invite and tag your friends - this class is great to do with a friend or loved one! Please bring your own needle nose pliers and wire cutters if possible - but we will have a few to share! In hectic, busy 2019, remember to take time to have a little bit of ceremony in your life! Drumming is an excellent way to calm your mind, heal your body and empower your spirit! This class is led by Charlie, the manager of Wisdom of the Ages! 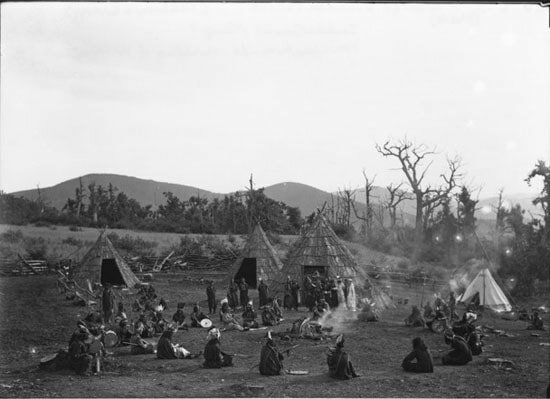 ~ We sit in a circle and use Native American drums ~ just listening is so healing! The sound of your mother's heartbeat in the womb, the sound of your heartbeat, connecting to Mother Earth... No experience necessary! We will lead you in some rhythms and let the spirit move you! We will cover a variety of traditional Native drumming rhythms, with explanations on ceremonial and energetic healing purposes! It can be very healing and uplifting, to help release negativity and accentuate positivity! ~ Come drum with us & absorb the powerful healing energy of the drum! Beginners always welcome! This class is $10 per person and everyone gets a free pocket rock! Send us a message or give us a call to let us know you're coming to try out a class! 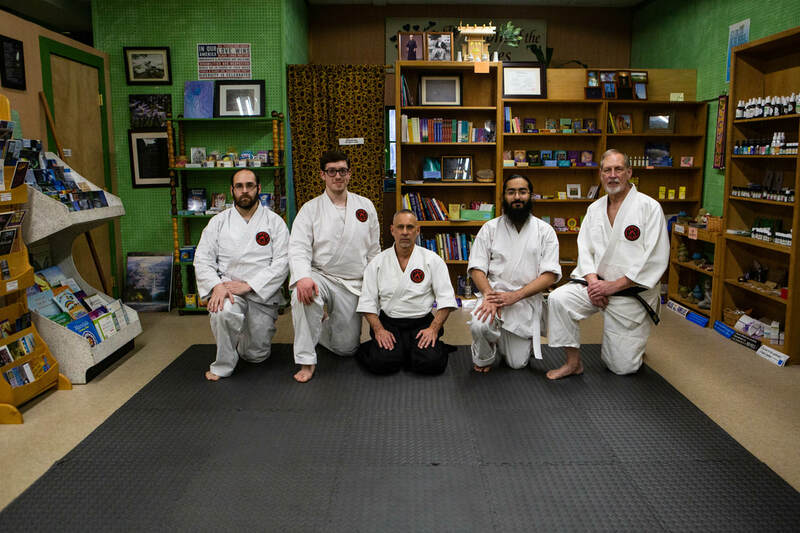 This is an authorized Daito Ryu Aikijujutsu Study Group, sharing the art of Daito Ryu under Roy Goldberg Sensei, and is led by our own Charlie Siegel. Classes are inclusive of all abilities and new students are welcome to attend and try out a class at any time. 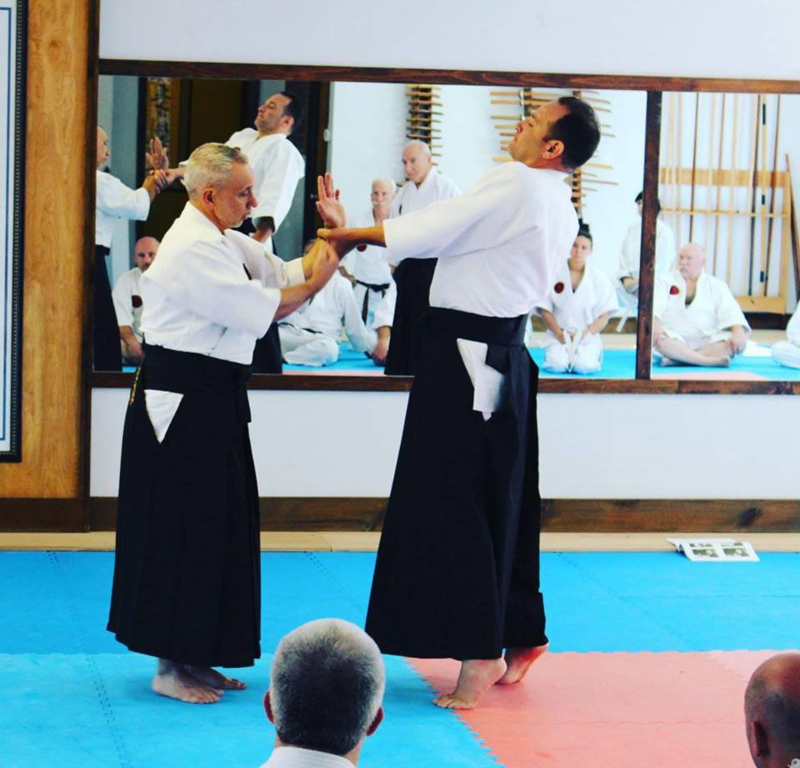 Weekly classes are held inside our store in Simsbury, CT, within the class space which is fully matted and converted to Hikari Dojo, a separate training space utilized for these classes. Daito Ryu Aikijujutsu is a 1,200-year-old samurai martial art and National Treasure of Japan. Its core principles focus on subtle manipulations of balance that can complement and enrich any martial arts training. Daito Ryu is not just a set of techniques, but a mindset that can transform budo practice. It has directly influenced the development of many popular martial arts, such as Shorinji Kempo, Hakko Ryu Jujutsu, Hapkido and most famously Aikido, whose founder Morihei Ueshiba trained extensively in Daito Ryu. We welcome both current students of the martial arts from any style or practice as well as new-comers to the martial arts, interested in walking a path of better health, well-being, balance, fitness and safety. Charlie is dedicated to the practice of making each class fun and informative, training traditional waza (techniques) of the art and walking a path of inner growth. Classes are open to both teens and adults. Classes are $15 each or you can receive a discount by paying a monthly rate of $55. Trial period classes can be attended in any comfortable workout style clothing. 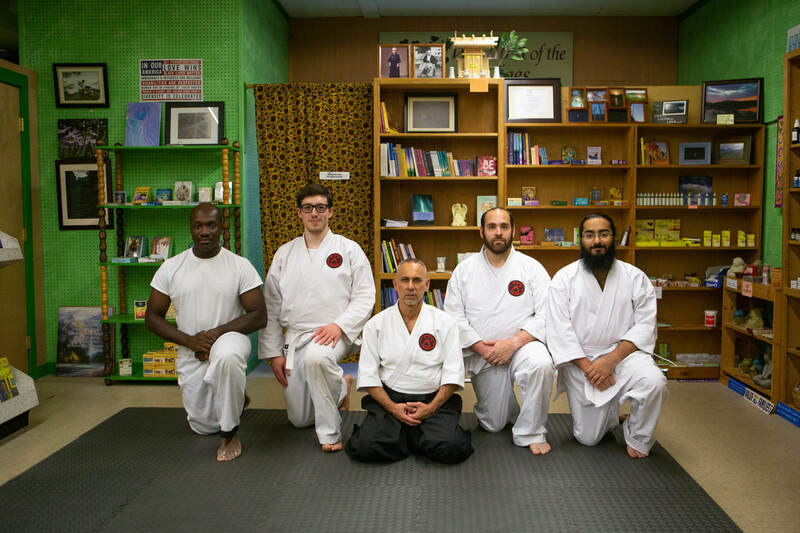 Students who wish to train with us on a regular basis can become members of the organization under Roy Goldberg Sensei and would then attend classes in a traditional white gi and belt, which can be purchased through Charlie and which include a patch for the Daito Ryu organization. 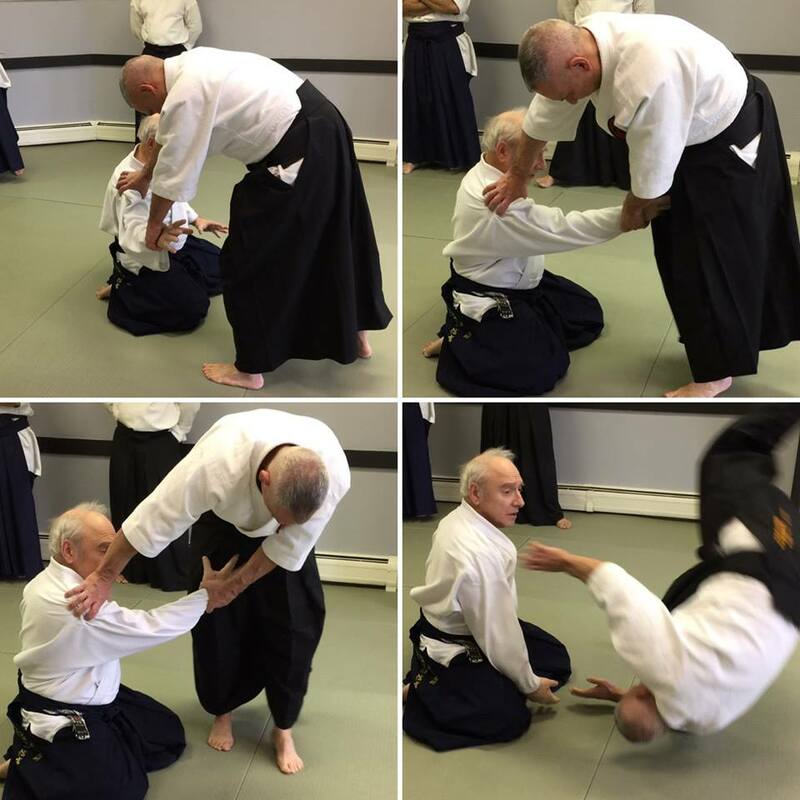 Please visit DaitoRyuAikijujutsu.net for further information on the art, the training and Roy Goldberg Sensei. We will also be hosting seminars with Roy Goldberg Sensei and/or his senior-most student Manny Jimenez Sensei throughout each year. Manny Jimenez Sensei will be teaching here next on Sunday, March 31, 2019, 12pm-5pm. Contact us to reserve your space! We hope to train with you soon in this beautiful art. Please message or call us with any questions. Hikari means "Light" in Japanese. 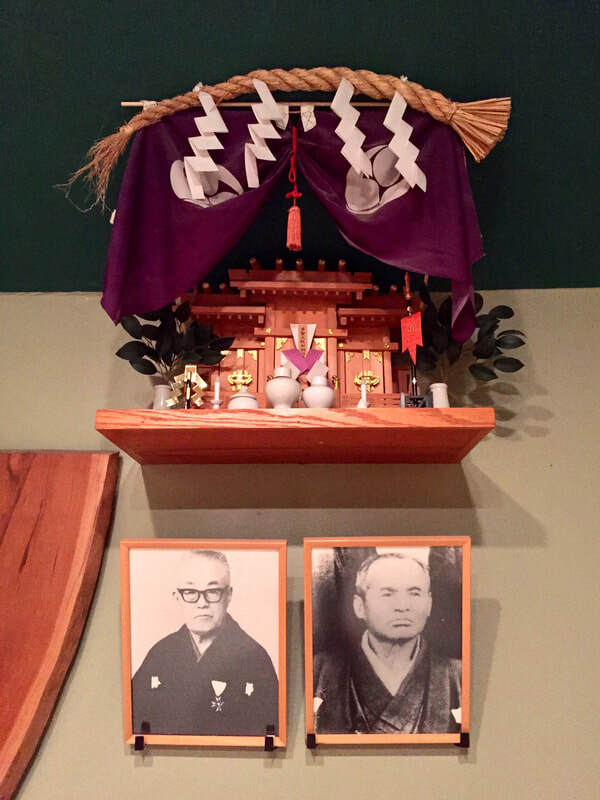 Hikari Dojo at Wisdom of the Ages is a place for inspiration and illumination, to find and develop one's center and to train in the traditional Japanese art of Daito Ryu. Contact us to reserve your space or if you have any questions! This seminar will feature direct instruction from Manny Jimenez Sensei, Roy Shingen Goldberg Sensei's senior student. ​Join us for an afternoon of hard training in this rare and beautiful martial art! Whatever style you practice, the principles of Daito Ryu will enhance your technique and understanding of your art. The focus is on developing superior structure and balance while destroying that of your opponent. Although some experience with taking ukemi (rolling and breakfalls) is recommended, it is not required. Jimenez Sensei will demonstrate techniques for students of all ranks and experience. Manny Jimenez Sensei is the Senior Student of Roy Goldberg Sensei and a student of Kiyama Hayawo Shihan since 1995. Jimenez Sensei has been awarded the Daito Ryu Aikijujutsu Kodokai Rank of 4th Dan and the Hiden Mokuroku, 1st scroll from the Kodokai Hombu Dojo in Kitami, Japan. He received his 5th Dan from Goldberg Sensei as well as the second scroll. Manny Jimenez has been in training in the martial arts since 1973. This event is open to all martial artists and schools and is inclusive of all skill and ability levels. Daito Ryu Aikijujutsu is a 1,200-year-old samurai martial art. It has directly influenced the development of many popular martial arts, such as Aikido, Shorinji Kempo, Hakko Ryu Jujutsu and Hapkido. Daito Ryu’s core principles and focus on subtle manipulations of balance will complement and enrich any martial arts training. Once a secret art, passed generation to generation through the Takeda clan, the system of Daito Ryu Aiki Ju-jutsu was revived in the late 19th century by Sokaku Takeda, 32nd in line of the Takeda family. 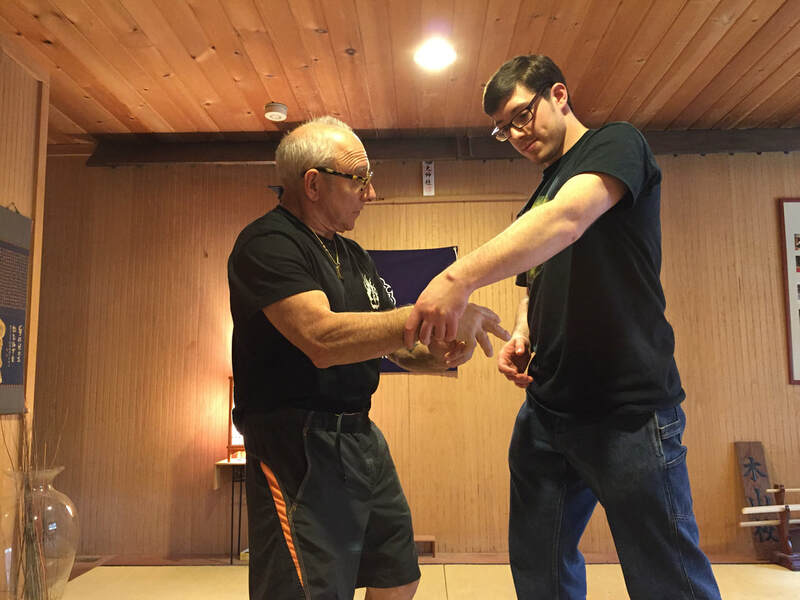 Weekly classes are held here in Hikari Dojo at Wisdom of the Ages with Charlie Siegel, an Authorized Daito Ryu Aikijujutsu Study Group under Roy Goldberg Sensei. Attendance of these weekly classes is not required for attending the seminar, but can be advantageous for those interested in training! As Goldberg Sensei says, "To understand aiki, you have to put your hands on somebody who has it. It’s like chocolate ice cream. I can’t explain it to you until you’ve tasted it. "You can’t get an explanation of aiki in words. You get an explanation in feel. Your body understands the feeling. It can only be explained in your body, both by the practitioner and the one who feels it. Your internal self develops so that you can explain it through your body. This isn’t mystical nonsense. Your body doesn’t have discussions with your brain. That’s why when I teach, I teach to your body, to your nervous system, not your brain. By teaching your body I’m teaching you how to develop aiki. If I teach to your brain I’m just teaching you technique. The greatness is in your body, so you can’t just get off the mat and intellectualize it and hope to develop aiki. "Shugyo is the only path." Jimenez Sensei will be demonstrating Aiki and teaching some of the powerful techniques and principles of Daito Ryu Aikijujutsu. - A wonderful opportunity for training! ​- Contact us to reserve your space!